The Caspian Higher School of Interpreting and Translation is famous for its multi-faceted approach to the training of linguists, and one of its strong points is close cooperation with leading international organizations, including the United Nations! Last week Nikolay Telnov, an interpreter of the Russian booth of the UN Office at Vienna, visited the School. Nikolay Telnov gives a master class twice a year and every time he brings something new and even innovative to his classes with our students. A subject chosen by Nikolay for interpreting exercises was rather urgent: this time, our MA students were given speeches of the 73rd session of the UN General Assembly that opened on September 18, 2018. The students interpreted speeches of political leaders from all around the world: these were heads of superpowers such as USA, and very small countries, e.g. Eswatini and Tonga. The students learnt to catch speakers’ manner of delivering a speech and enriched their active vocabulary with new words that are crucial for a successful work at the UN. The exchange students from Italy who are studying this semester at the Caspian High School of Interpreting and Translation surprised Nikolay Telnov with their interpretation of Sergey Lavrov’s speech into Italian. The lessons were carried out throughout the week from early morning till late evening. Nevertheless, the students were not tired with such a busy schedule, and in the course of lessons they also started taking the initiative in choosing speeches; as for our first year students, they overcame their embarrassment quickly and tried taking a seat in the booths among the first to demonstrate their skills. After the interpreters’ performance, Nikolay pointed out each student’s advantages and gave recommendations on how to improve their skills. 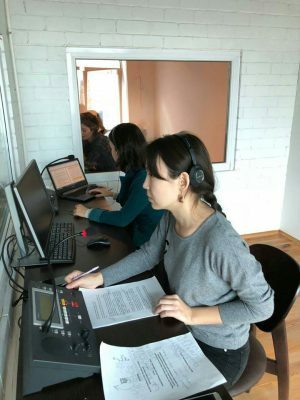 Sight translation was also an important part of preparing for simultaneous interpretation, as the students could propose their versions and choose the best one. Moreover, Nikolay told a lot of stories from his own experience, so the atmosphere of the lessons was quite friendly and pleasant. 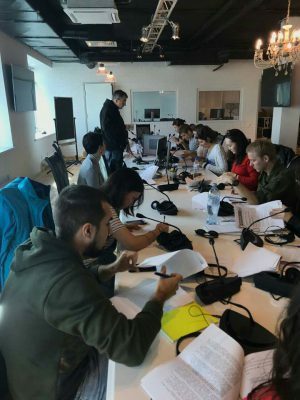 This time, the 1st and 2nd year MA students worked together and found this approach very useful because the first year students, by the example of their experienced peers, saw what kind of results a Master’s student could achieve at the Caspian High School of Interpreting and Translation in just a year. The students are satisfied with their new experience of participating in a master class by the UN expert and are looking forward to seeing Nikolay Telnov again!